Didn’t know this thing existed until about a week ago. Most of these are cargo planes, but from what I could find there are some for passenger transit. This is a really good thing considering the fact that the cargo bay on this is 200% polluted with parts just clipping in everywhere. If you firewall the throttles right from the get-go you’ll have right engine flameouts until around 40m/s. considering the already bizarre part count I didn’t feel like adding another 20-40 intakes to solve this issue. The engines’ fairings make it so that you cant actually get any air inside them DESPITE THE FACT THEY ARE WIDE OPEN (SQUAD)! 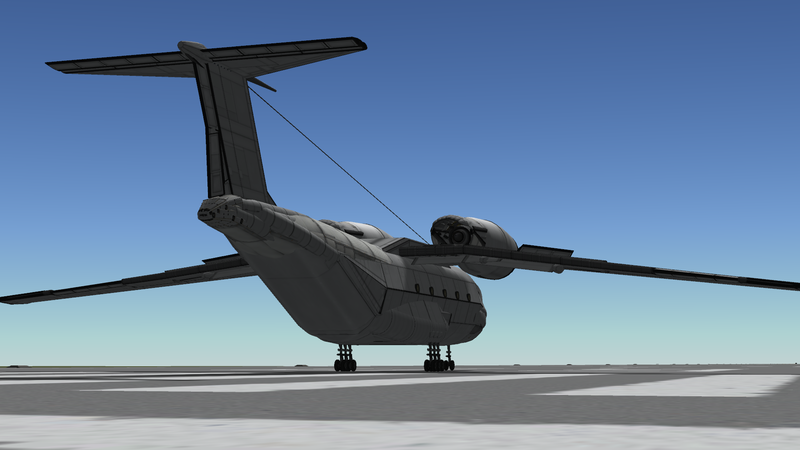 I had to put smaller intakes on the fuselage of the aircraft to try to feed the aircraft, hence the flameout problem. Be careful when you toggle reverse throttles, the engines overheat VERY quickly due to their clipped nature. Fixed the DLC parts involved, it’s now pure stock. The flameouts will still happen at under 30m/s at full throttle but it’s a little better now. A stock aircraft called Antonov An-74. Built with 1125 of the finest parts, its root part is mk3Cockpit.Shuttle.